The Rebel Sweetheart. : Timeless Tradition | New Years Eve in NYC! Amazing how time flies by so fast. Still feels like yesterday when we welcomed 2012, and now look - we're halfway through December and just a week away from Christmas Day. It's only a matter of time before the year ends and we finally bid 2012 adieu. Surely there'll be parties and celebrations left and right, here and there as we usher in the New Year. But I'm sure no other celebration is as fun and exciting as Times Square New Years Eve. With revelers filling the streets, Hollywood personalities gracing the center stage, performances from world-renowned bands and artists, and an hourly countdown to keep everyone on their toes - it's a party like no other come the 31st in this part of New York City. And then there's the famous Ball Drop - a tradition that dates back to 1907 - the highlight, and the most important part of this celebration. From a height of 70 feet, the lighted Ball descends within sixty seconds. As the Ball drops to the ground exactly at the stroke of midnight, its lights go off and the numerals of the New Year (for the coming year it's 2013) come to life and shine high above Times Square. This event is something you have to experience first-hand at least once in your life. 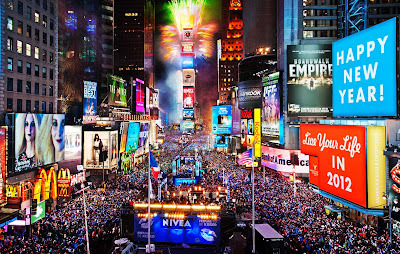 The Times Square New Years Eve party is something my friends and I have long been wanting to go to, and I can't wait for the day when I'll finally be crossing it off the bucket list. I'd love to experience New Year's Eve at Times Square in this lifetime. Must add that to my bucket list. Maybe I should add New Year in New York as part of my bucket list too. Great post. Liked it very much. I like new year parties. This is also in my bucket list. I have been to New York almost 21 years ago when I was 4 years old. I can't even remember. Ok, I feel kind of bad for what I am about to share.....I went to Times Square on New Year's about 25 years ago and it was HORRIBLE! It was cold and drizzling...we had nothing but a card board box to put over our heads. We were frozen. We stood there for hours in the cold, with the crowds, not really doing anything. If there was live music or entertainment we couldn't hear it. After several hours we saw the ball drop and then that was it, the crowd began to disperse, the police "encouraged" us to get the heck out of there...so we braved the crowd back to the train and went home. I will never, ever, do that again. They make it look much more fun on TV than it really is. Trust me, it is much better to watch the ball drop surrounded by loved ones in the comfy, coziness of your living room! One day I will be in NY for one. Oh yes, one day I will!